General manager Ryan Pace said an MRI revealed that Burton (groin) is dealing with a "significant" injury, Adam Hoge of WGN Radio 720 AM Chicago reports. Analysis: Burton popped up on the injury report just days before Chicago's wild-card meeting with Philadelphia and was ultimately inactive for the playoff defeat. The specifics of his injury remain behind closed doors, so it's hard to put a firm timeline for when Burton may be ready to run around again. At this point, it's far from certain that he'll be healthy in time for the start of OTAs in May. Burton, who was inactive for Sunday's playoff loss to the Eagles, relayed Monday that after a full practice Friday, his groin locked up Saturday, Patrick Finley of the Chicago Sun-Times reports. Analysis: The tight end was unable to rally in time for his team's wild-card loss and will thus have the entire offseason to move past what is not a long-term issue. In his first year with Chicago, Burton hauled in 54 of his 76 targets for 569 yards and six TDs in 16 games. 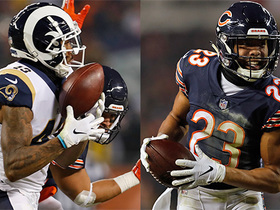 The 27-year-old remains under contract with the Bears through the 2021 campaign and therefore is in line to maintain a key role in the team's Mitchell Trubisky-led offense in 2019. Burton (groin) is inactive for Sunday's wild-card game against the Eagles. 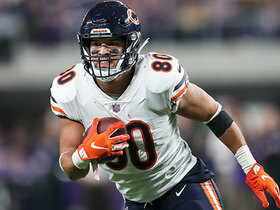 Analysis: With Burton out, Adam Shaheen and Ben Braunecker will head the Bears' tight end corps, with Daniel Brown also in the mix. Burton is listed as questionable for Sunday's wild-card game against the Eagles with a groin injury. Analysis: Burton's late injury designation is a major concern as he wasn't listed on the injury report all week. The specifics and severity of the injury remain unclear as the 27-year-old is likely to be a game-time decision. Burton brought in five of six targets for 33 yards on the Bears' 24-10 win over the Vikings on Sunday. Burton caught five passes for 30 yards in Chicago's 14-9 win over the 49ers. Analysis: Burton hauled in each of his pass targets, but his longest catch of the day was just eight yards, as the 49ers' defender typically tackled him as soon as he got the football. He's been unable to post more than 40 yards in any of his last nine games, and he'll end the regular season with a difficult matchup at Minnesota. Burton caught four of seven passes for 36 yards and a touchdown during Sunday's 24-17 win over Green Bay. Burton caught two passes for 22 yards in the Bears' 15-6 victory over the Rams. 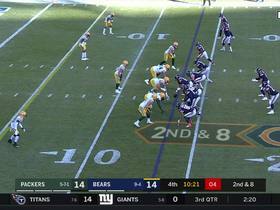 Analysis: Although Burton was targeted five times, the Chicago passing attack was stuck in neutral in this contest, and he was actually second on the team in receiving yardage. With fewer than 30 yards in each of his last four games, he's become a low-upside fantasy option. Burton wasn't targeted in the Bears' 30-27 overtime loss to the Giants. Analysis: In a game where Chase Daniel threw 39 passes, it was surprising Burton didn't see a single target, and he's now exceeded 40 yards just a single time since Chicago's Week 5 bye. In addition, he's found the end zone once over his last six games. After being a solid fantasy option earlier in the season, his recent performances have made him a risky fantasy option. Burton caught four passes for 28 yards while losing a fumble in the Bears' 23-16 win over the Lions on Thursday. Analysis: Burton was targeted seven times, but he struggled by losing a fumble and dropping a pass while failing to do much damage as a runner after three of his receptions. He's now posted fewer than 30 yards in four of his last five games with just one touchdown during that span and fantasy owners will now need to weigh out their lineup options before considering him an automatic starter each week. Burton caught one pass for nine yards in the Bears' Week 11 win over the Vikings. 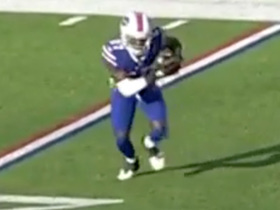 Analysis: Burton actually caught a screen pass that would've been for more than 20 yards, but the play was called back for holding. Otherwise, Mitch Trubisky threw 22 passes toward his wide receivers while directing just a single pass to his primary tight end. With just one game with more than four targets and 40 yards over his last seven games, his recent production has made him a touchdown-dependent fantasy option at tight end. Burton caught four passes for 40 yards in the Bears' 34-22 win over the Lions. Analysis: Burton was targeted four times while Allen Robinson and Anthony Miller led the team in receiving. Burton has been held to 40 yards or fewer in four of his last five games, but with five touchdowns on the season, his ability to find the end zone makes him a strong weekly starter at tight end. Burton caught two passes for 28 yards and a touchdown in the Bears' 41-9 victory over the Bills. Analysis: Controlling the game throughout, the Bears needed to throw just 20 passes, which resulted in Burton being targeted just three times. Fortunately for his fantasy owners, he was still in the game late in the fourth quarter when the team had a big lead and caught a late touchdown pass to salvage his fantasy day. Although he's been held to fewer than 30 yards in three of his last four games, he's also scored three times during that span, making him a solid weekly starter at tight end. 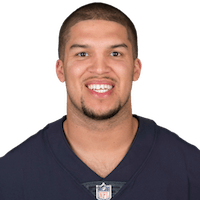 Chicago Bears tight end Trey Burton makes plays all over the field in Week 17 win vs. the Minnesota Vikings. 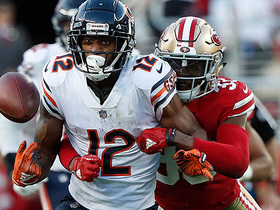 San Francisco 49ers cornerback Tarvarius Moore punches the ball away from Chicago Bears wide receiver Allen Robinson for a key turnover. 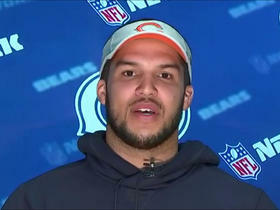 Chicago Bears tight end Trey Burton talks about what it means to be the Bears' Walter Payton NFL Man of the Year nominee in his first year in Chicago. Chicago Bears quarterback Mitchell Trubisky finds fullback Michael Burton for a 13-yard touchdown. 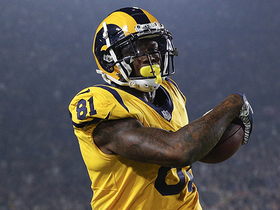 The Los Angeles Rams and the Chicago Bears trade back to back interceptions. 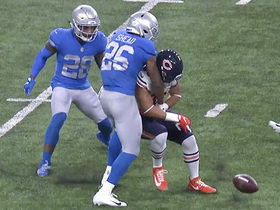 Detroit Lions linebacker Jarrad Davis grabs the loose ball after it was punched out of Chicago Bears tight end Trey Burton's hands by Lions cornerback DeShawn Shead. NFL Network's "NFL Fantasy Live" crew spotlights eight players who are trending up or down in Week 12 and beyond. Buffalo Bills cornerback TreDavious White intercepts the Chicago Bears quarterback Mitchell Trubisky, and returns it for 37 yards. 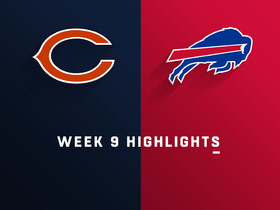 Watch the highlights from the Week 9 matchup between the Chicago Bears and the Buffalo Bills. 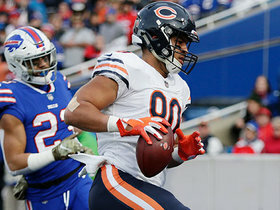 Chicago Bears quarterback Mitchell Trubisky connects with tight end Trey Burton for easy touchdown.